When you think of lace it often conjures images of little old lady doilies, rigid Victorian collars or formal wedding gowns. 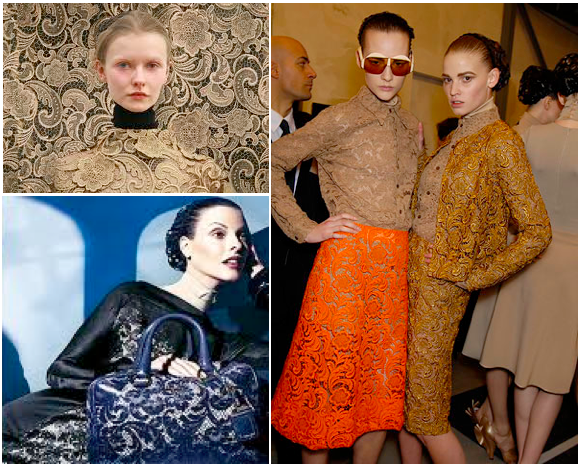 In recent years, it’s been making a comeback on the runways and one collection I particularly loved was Miuccia Prada’s Fall 2008 ready-to-wear collection of handmade Swiss lace garments. It gave lace a powerful, modern edginess and I think we’ve seen the results in any store we walk into nowadays; there’s a renewed interest in lace in everyday wear. Beyond the world of fashion, other artists have been reinventing lace, rethinking it’s role in culture beyond typical adornment. In 2007, the Museum of Arts and Design in NYC held an exhibition called Radical Lace & Subversive Knitting which explored the resurgence of these crafts in contemporary art. These artists re-evaluated the technical aspects of lace and reinterpreted what lace can be based on its construction (creating interlocking structures in patterns that permit light to pass through them). 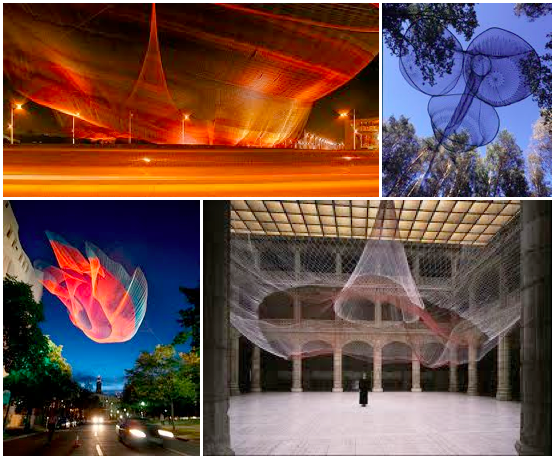 I think one of the more interesting artists was Janet Echelman who often incorporates lace-making techniques to create large-scale installations that interact with their environments. Knitting is a textile-based craft that has seen a huge following in the past few years, but this week I’m interested to learn more about lace making. I will explore the basics of learning the technique and depending on how that goes, I’ll experiment a bit with where I might take it! You are currently reading anything but dainty lace at 52 To Do.